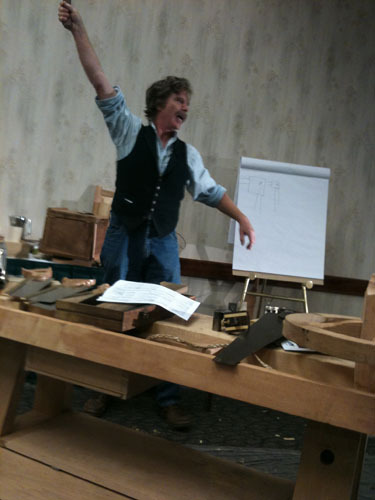 Day two at the Woodworking In America conference was just as packed as Day one, including more classes with Roy Underhill, Ron Herman, Frank Klausz, Bob Lang, Jim Tolpin and George Walker. I realized about halfway through the day that I was going to miss out on taking a class with Michael Fortune…a very sad realization. I heard his classes were fantastic from the other folks at the conference. As for the classes I did attend, they were just as good today as yesterday. Watching Roy Underhill and Frank Klausz banter back and forth while describing their individual methods for dovetailing drawers (pins or tails first??) was a treat, as was seeing Roy Underhill cutting tenons by hand. Roy Underhill was standing ON the workbenches almost as much as he was standing OFF the workbenches. 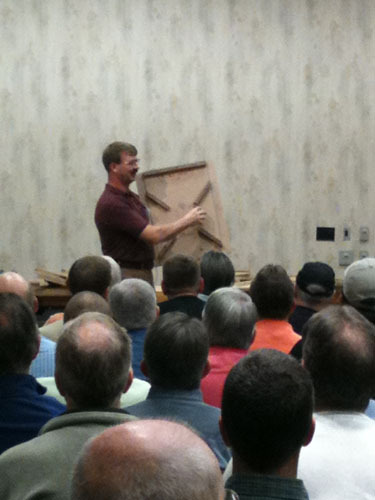 Ron Herman showing off the uses of one of the many shooting boards he brought to class. Jim Tolpin gave a great class on handplaning boards, with tips about making your own winding sticks, keeping the base of your plane well lubricated, (Keep a piece of camellia oil soaked carpet on a block on your bench, and then run your handplane through the carpet to lube it up whenever you need it! So simple!) and an easy-to-follow rundown of his method for planing a board from rough to smooth. George Walker gave a master class on design using simple shapes and forms, and at least for this beginning woodworker, the world has started to break down into circles, squares and rectangles wherever I look now. George certainly helped me to see things that I hadn’t seen before, and I loved the comparisons of the flourishes at the top of a Queen Anne style highboy to the neck of a swan. Overall this has been an amazing weekend, with great classes that worked at all levels. Even as a relative newcomer to woodworking, I found the topics easy to follow and inspiring for my own future woodworking plans, and I talked to many experienced woodworkers who were also excited about the tips and tricks they were learning. I credit the fantastic teachers as well as the warm and friendly group of woodworkers who attended the conference for this great experience. It was inspiring to see so many people gathered in one place who have this enthusiasm and passion for their craft. I think Roy Underhill summed up this dedication to all things woodworking best when he said “Some people remember all the dirty parts in movies…well I remember all the woodworking parts.” Pretty sure after this weekend I will too, Roy. 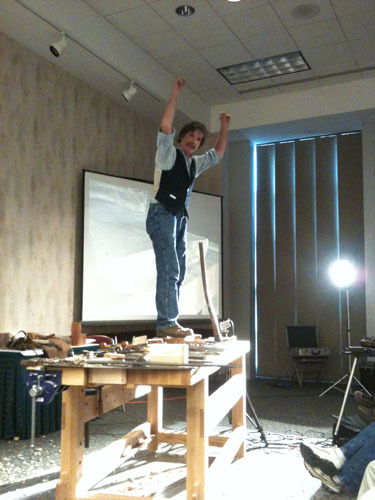 Roy Underhill, reenacting a scene from his favorite woodworking/gladiator movie.